Generally when I write a blog post, I write about realistic and true things. My journalism background forces me to seek out the truth (Umm... Ermm... Umm... Ohhhh...). But this matter I've encountered sits just on the outskirts of truth and because of that, I must bring it to light. 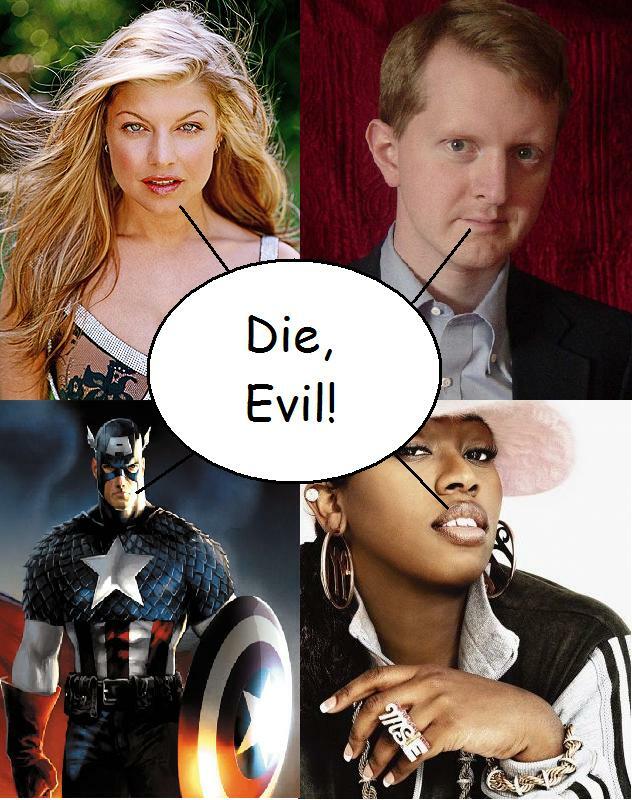 Fergie, Missy Elliott, Captain America and 72-time Jeopardy champion Ken Jennings must unite. They must unite and form a death metal band that fights crime. I didn't just manatee ball those names. No, why they must come together is because of an amazing dream I had last night. It started out with just those four in a band, playing their death metal hearts out. Sure, KenJen and Captain America had no musical ability, but no death metal musician really does, so it didn't matter. The sheer awesomeness of seeing such disparate people together more than made up for it. And the fact that nobody could understand them—gravy. But the death metal extravaganza soon paved way to attack. A giant pill bug rolled in and broke up the concert. Now I'm not sure if this was all part of the show or if former game show winners tend to attract Armadillidiidae that are pissed off at the world. Regardless, our fearless band of bandmates quickly jumped into action. Quite the dream team up. They all roly polied into their own ball and proceeded to mash into the pill bug, beating it into smithereens. It helped that every time Captain America rolled up, a blast of shield shaped light shot out of him, which I imagine tends to frighten pill bugs. It certainly frightened me. And it let the band crush the bugs and live on to rock another day. As I said, this occurred during one of the most glorious dreams on record. Even better than one where undeniable forces of darkness invaded my soul and sucked out my ability to live or think rationally. In that one, I lived as a shell of a human, in an eternity of dark depressingness... it was much better than that nightmare. But that is the extent of the dream, and it might leave more questions than answers, I'll attempt to tackle some of those questions right now. The first one is obviously “... what?... No, seriously... what?” While that's a very question, you should really be asking a different one of the five W's—how. As in “... how?... No, seriously... how?” Well, once this blog post gains traction, I'm certain all of those pseudo-quasi-celebrities will have to give in to the people's demands and unite as a band and fighter of crime. Another question—“Why is Missy Elliott in this band?” Well, I know absolutely nothing about who Missy Elliott is. The only reason I could identify her is when she came into the dream, the neon lights behind her (also dream supplied) flashed “Missy Elliott!” As a result, she added nothing to the band, much like her contributions in “The Traveling Wilburys.” So it's really because my subconscious hates me and wants to confuse me. Yet I will still honor her contributions (her Roly Poly get up looked near the best, definitely top 4 in the band). The final question you probably have is “What can we call this awesome band of awesome?” Well, I think you just answered your own question right there. So Awesome Band of Awesome, the ball is in your court now. Please do realize I have a dream and you're the ones who can make it happen. I don't care if this only comes together in anime or See n' Say form, this needs to come to fruition. Please make it happen.